Jim Dorsett loved tinkering and Heathkits, which most folks have probably never heard of unless they had inveterate tinkerers in their homes between 1946 and 1980. For nearly the entire length of the electronics revolution between the end of “the war” and the beginning of the digital age, Heathkit taught a wide swath of American tinkerers how to tinker with circuit boards. While Jim would have probably cited the color television as his crowning accomplishment (at least in the world of electronics), the rest of us often pointed to something far less high tech. Christmas trees always presented a challenge. While Jim wanted a full and perfectly balanced tree (he loved Frasier firs), we rarely had a tree that rated more than a step above Charlie Brown’s choice for the Christmas play. At least to begin with. We walked down the slope from the house, found a small (under 10 feet), generally scruffy,white pine, and hauled it back up the slope to the road and then the length of the driveway, leaving a trail of needles and small branches. Jim would wander off and come back with an armful of extra branches, not always from the same type of tree. He called it “filling in.” Once the tree was on the porch, he pulled out his power drill and set of drill bits and start adding branches. By the end of the process, the tree looked less like a Charlie Brown special and more like a well-shaped silvaculture experiment. The Scale Cabinetmaker provided Jim with the perfect opportunity to tinker. Along with Jim Jedlicka (the other inveterate tinkerer and a retired NASA engineer), he spent hours testing and tinkering with tools and jigs and fixtures. The Product Review column and the wide variety of tool and technique articles that appeared in TSC over the course of twenty years were a result of his (and Helen’s and Jim J’s) cconstant curiosity. He always started a product review with three questions: 1) how does it work; 2) what are the shortcomings and the benefits; and 3) how can we make it work better?” Not surprising, he loved Consumer Reports, and based the Product Review column on the CR methodology. 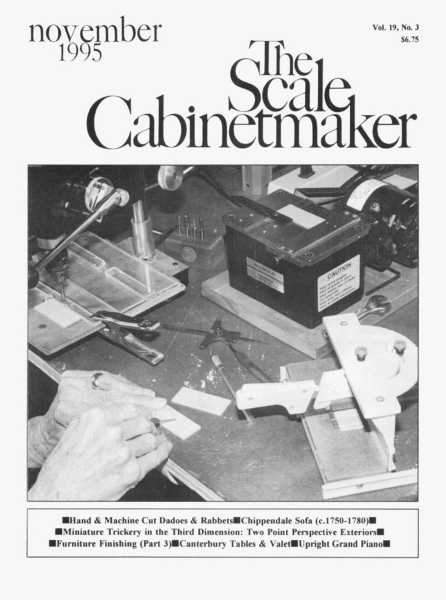 Every product covered in The Scale Cabinetmaker was tested on the workbench: not as a one afternoon test or a quick drive-by, but a test that often lasted from two to three months (the period between issues) up to a year and involved putting the products through their paces. This was especially true for tools and potential safety issues. and helpful description of products that are useful to the miniaturist. The “TSC Product Review” column, which lasted through the final issue of The Scale Cabinetmaker was first developed during the halcyon days of the miniature craft, the boom of the 1970’s and early 1980’s. New products for the miniaturist were appearing almost daily (or so it seemed at the time.) Because the journal’s long-term health was based on subscriptions and wholesale orders, rather than advertising, Jim worried less about the impact of a less than positive review on the financial health of the journal. 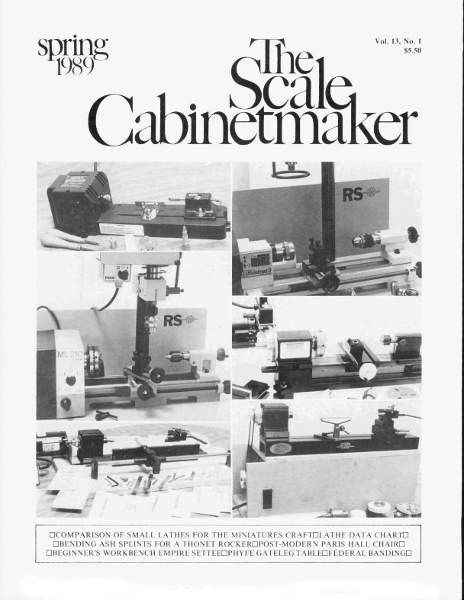 Over the years, the reviews did cost TSC some advertisers; however, they also helped to improve product designs and gave readers a trusted voice when buying miniature tools and materials. Nothing is quite so frustrating to the scale modeler as the attempt to hold a handful of freshly glued miniature parts together while applying some clamps to the assembly and trying to maintain the alignment. It is probably the source of more tooth- grinding and muttering than any other workbench procedure. So anything that offers aid and comfort to the afflicted is worth looking into. 1/4″ x 11 1/4″ working area. These provide a square corner into which work can be laid and held. Assemblies in the fig are held in place by the setting of four rectangular magnets around the two open faces of the work piece. Each magnet is sandwiched (and riveted) between two steel cover plates, which assure a secure grip with the jig base. In concept, the jig is a very simple and useful idea. The low height of the fences make the jig most useful in gluing flat assemblies: eg. panel doors, window sashes, the side assemblies of a rail and stile case piece. In such jobs, the parts can be laid out on the base against the two fences, blue applied, and the assembly clamped with little trouble; the jig is best for such work. It makes short work of irregularly shaped flat assemblies, ie., the kind that defy normal clamping tools because of their non-parallel sides. A trapazoidal chair seat frame, for example, can be quickly set with one parallel side against the fence and magnets holding the remaining sides in position. Even the irregularities of a sofa base have succumbed to the flexibility of the jig (so long as the components being clamped do not extend above the level of the fence and magnets). The jig is less useful for gluing assemblies that extend much above the height of the low fence, ie., if the higher you go above the plane of the base plate, the less clamping pressure is maintained by the magnets. So a shelf unit that is no more than an inch deep can be clamped with pressure on all joints, but a carcase that is several inches in depth cannot. overlaying the base with wax paper and by giving the base an occasional scrubbing with steel wool. One feature of the jig was found to be of little use for our purposes, ie., the scored 1″ grid. The size of the increments (1″) provides a pattern that is perhaps decorative but too large to be of much practical use (except as points of reference from which to measure. Over the past six months, the magnetic jig has become a standard fixture on our work bench, holding down everything from doors to tracings. It hasn’t replaced our assortment of other clamping devices: C-clamps, spring-loaded cross tweezers, clothes pins, violin-maker’s clamps, etc. But for the quick and easy setting of flat assemblies, it has no equal. Unfortunately, many of the products (including Geoffrey Bishop’s Magnetic Holding Jig) reviewed by the folks at TSC have long since disappeared from the market as a new product, but remain in circulation through ebay and other online sales sources. If you are looking at purchasing an older or used tool or jig, it is worth checking out the Product Reviews before purchasing.